Today only this Origami - The Everything Organizer is just $22.99 (Reg. $39.99)! Make the most of your time and space with this Origami-The Everything Organizer. No tools required, no assembly, and an ultra-flat fold which lets you get the ultimate in versatility and the easiest, quickest setup. 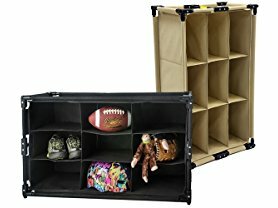 Store your shoes, clothing, art and crafts, purses, and much more! And, they're stackable, so you can customize your space.